Abayas are specially designed to meet the needs of Muslim moms and they are available at numerous online stores, as well as retail outlets. They are trendy, casual and comfortable, just perfect for the modern Muslim women, who in addition to being stylish, want to maintain tradition and modesty in their dressing style. Butterfly Abayas: In this style of abayas, a seam is stitched into the fabric, which brings excess fabric on the sides, creating a wavy look for the garment. The seams are easily adjustable, as the previous seam can be removed and a new one can be stitched either outside or inside the previous seam. They are highly preferred by pregnant Muslim women as the seams can be altered according to the space requirement on the waist or hips, during the different stages of pregnancy. They can also be brought back to the original size after pregnancy. Bisht Abayas: This type of abayas have an open width and are very loose, as the waist measures around 100 inches. It can be worn by slim as well as full-figured pregnant women. The open width of the garment makes it comfortable to be worn during the entire duration of pregnancy. Altering the dress is not required. Another important benefit is that there is an abundance of fabric in the garment and it is designed in a way that tones down the size of the belly, making a woman look slimmer. This abaya can be worn even after pregnancy, as it doesn't give the appearance of a maternity abaya. Shoulder Close Abayas: These abayas are very popular and are sometimes preferred over the other two. Shoulder close abayas have an open design. A piece of fabric is attached to the shoulder and it can be wrapped around the front, giving it a closed look. As the abaya is open, it is flexible around the waist and hip area. The fabric can be loosened as the pregnancy progresses. 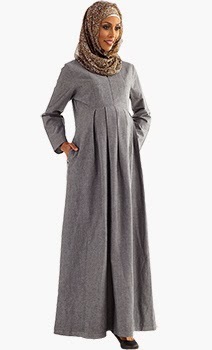 Maternity abayas are loose fitting with easy front openings and they come in a wide range of colors. Along with other features that make the clothing more convenient and comfortable for pregnant ladies and new moms, they are also available in V-Necks and long zippers. These abayas will fit a lady throughout her pregnancy, as her belly keeps growing.